Due to poverty and some other reasons many parents left behind their children to work abroad. 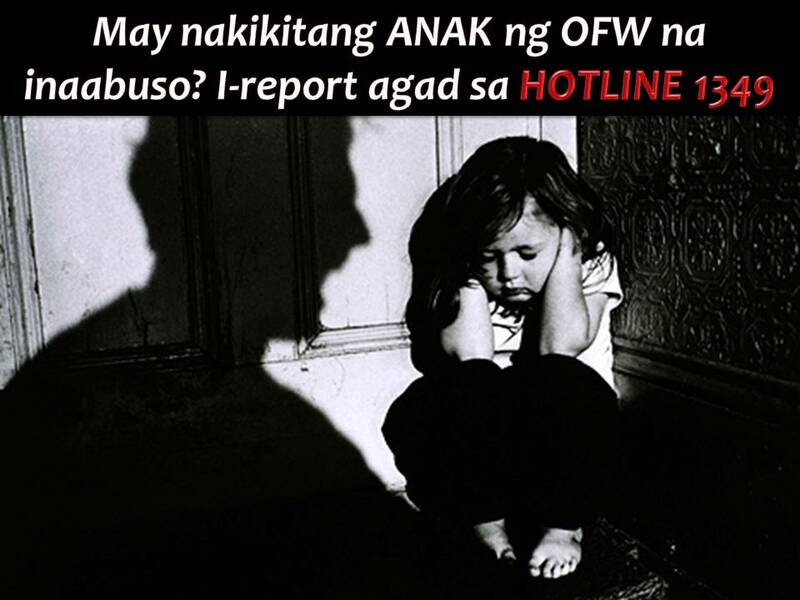 Hence these OFWs children are the one who is very prone to neglect and abuse. 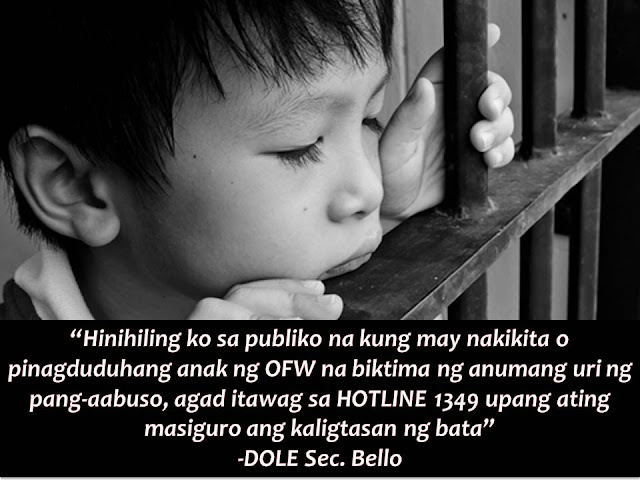 With this, the Department of Labor and Employment (DOLE) has appealed to the public to report abuses of children of OFWs through its Hotline 1349. DOLE will investigate and validates the reports received by Hotline 1349 in coordination with the Department of Social Welfare and Development (DSWD), and the Department of Justice (DOJ). Last year, an OFW working in Bahrain came home to bury her 2-year- old son who was mauled to death by his guardians in Davao City. “We have to protect these children. 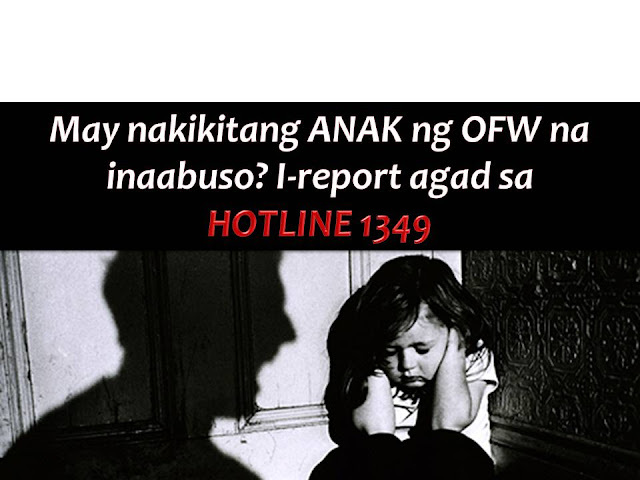 One way of protecting them is to report this to our Hotline 1349. We will investigate, and if necessary, rescue the child. Mahirap kasi na ang pinagtitiwalaan mo na mag-aalaga sa anak mo ay iyon pa ang mag-aabuso sa mga bata,” said Bello. Secretary Silvestre Bello III said the hotline is open 24/7. DOLE assures the OFWs to give assistance, shelter, and protection to their children who suffer abuses. Last week, DOLE, together with the Overseas Welfare Workers Administration (OWWA), Department of Social Welfare and Development (DSWD), and the Department of Justice (DOJ) signed a memorandum of understanding (MOU) that aims to provide full protection for children of OFWs who are in the care of guardians while their parents are overseas. 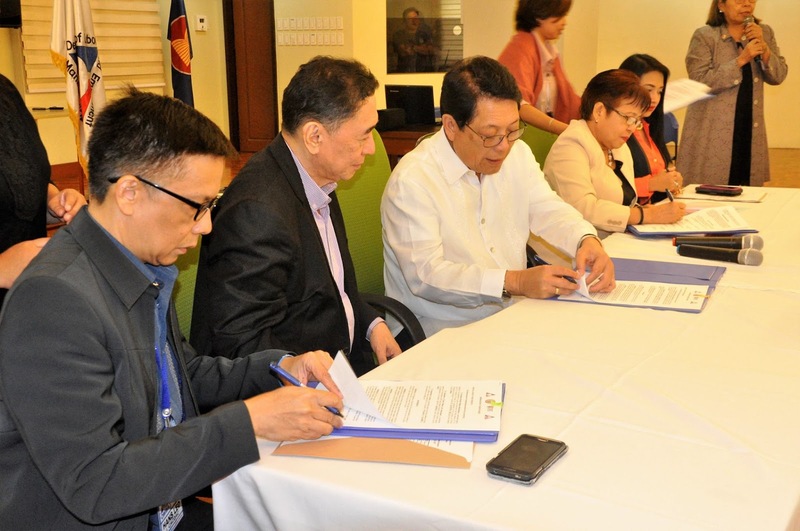 OWWA Administrator Hans Leo J. Cacdac said the MOU will ensure that OFWs can provide the needs of their children without worrying about their safety in the hands of people they entrusted them to. "Hopefully, thru this MOU among our partners, we will be able to realize a zero-victim/casualty of any form of abuse to children of OFWs," Cacdac said. "After all, we do not wish to see a double-whammy situation; an absent parent and an abused child." 3. Disseminate information on child abuse through OFW Family Circles (OFCs) and OFW Help Desks. OWWA added that Child Abuse and Exploitation module of DSWD will be integrate into training and orientation of OFWs.